Heading west some 500 metres from the entrance to the Port Arthur Historic Site along Nubeena Road there is a left turn that leads to a veritable feast of sights to see. The sign reads: ‘Remarkable Cave’. Passing behind the historic site the road meanders past peaceful Carnarvon Bay, with its old wooden jetties and fishing boats moored offshore, to the turnoff to the poignant remains of Point Puer; the British Empire’s first boys’ prison. Here, boys as young as nine years of age lived and worked separate to the older prisoners at Port Arthur. They had to work hard and were often badly treated; however the boys were given some basic education. Sufficient ruins remain to warrant the short drive to the gate that provides free pedestrian access to Point Puer. The crumbling walls pose a haunting and stark reminder of the suffering the boys must have endured here. The site also gives close up views of The Isle of the Dead, with Port Arthur in the distance. The same road also provides access to the nine hole Port Arthur Golf Course – a tricky public course providing some of the most spectacular views from its fairways and greens high atop the cliffs looking out to the bay. If your tendency is to slice the ball, make sure you take plenty of them with you! The road from Port Arthur continues past sandy Safety Cove to Basket Bay and the deservedly named Remarkable Cave. It is remarkable not only for its unique form, but also because its opening, when viewed from the observation platform at the bottom of a long flight of steps, is roughly the shape of Tasmania (see photo below). 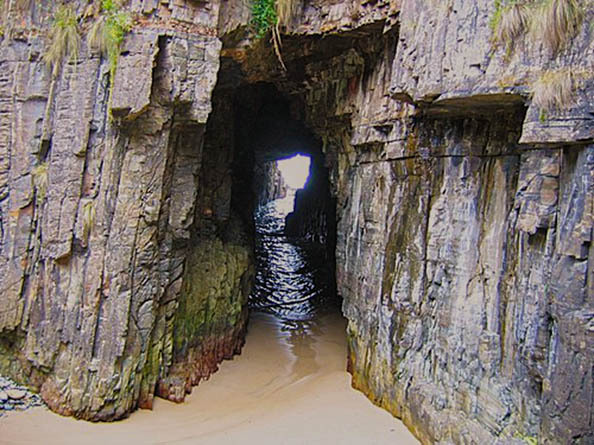 The cave has been carved out of the sandstone cliff face by the sea, forming a rock bridge. Near the viewing platform are huge boulders remaining from a collapse of the cave wall. The viewing platform at the bottom of 100 steep stairs is where the back of the cave collapsed. The debris has long since been washed out to sea except for the large sea-smoothed boulders that remain in the hollow. Interestingly, the Remarkable Cave has two entrances on the seaward side. 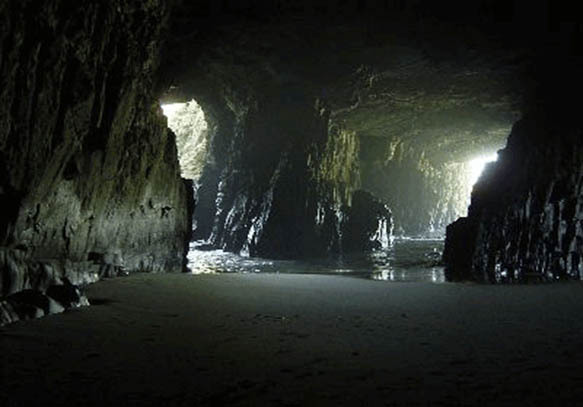 These caves were created by erosion along fractures created by ancient earthquakes and can be accessed at low tide. Part of Searle, E. W. (Edward William) 1887-1955. E.W. Searle collection of photographs. between ca. 1900 and ca. 1955. 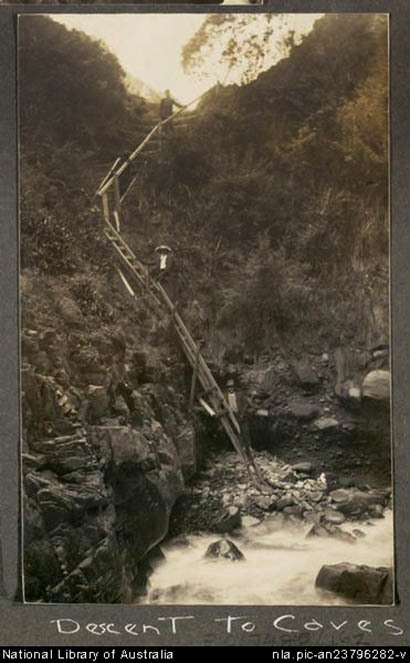 The original steps were quite a challenge as can be seen in this photo taken sometime between 1911-1915. The car park is a popular spot for surfers and there are usually quite a few cars and people milling about looking for the big waves which roll in off the shoreline. There are toilets on site.